Having a vinyl floor is great since it's inexpensive to maintain and replace, and it's pretty durable during years of wear and tear. However, lighter-colored vinyl floors can eventually take on a faded, almost yellow, color. These stains can be a bit unsightly and can make the floor seem as if it's worn out or dirty, even after it has been cleaned. The discoloration happens for a number of reasons, especially if rubber mats are used on them. If the vinyl flooring can't be replaced right away, there are a few tips for removing the stain and increasing the longevity of the vinyl floor. There are a number of commercial cleaning products that help get rid of stains all over the home. One common powerful cleanser is a solution of bleach and water. Mix three parts water and one part bleach in a bucket and use it to clean the stained parts of the vinyl floor. The stain may not lift entirely after being cleaned the first time. If the yellow discoloration is still visible on the floor after mopping, try adding more bleach to the solution or mopping with the solution regularly. If the stain has faded after a few cleanings, continue to use bleach and water regularly until the stain is completely gone. Just as lemons can lighten skin and hair, they can also help remove stains. For a more DIY approach to vinyl floor stains, mix 1/4 cup of lemon juice with 1/8 cup of baking soda. Once the baking soda dissolves and turns into a paste-like consistency, spread the paste over the stain and let it sit for about 10 to 15 minutes before wiping up the residue with a damp cloth or towel. If the lemon-baking soda paste doesn't work for removing really old or very stubborn stains, consider using rubbing alcohol. Make sure that the floor has been cleaned and then pour some alcohol over a washcloth. Rub the washcloth over the stain using a circular motion until it begins to fade. If it doesn't fade very much after being wiped with alcohol, add more to the washcloth and try rubbing it over the stain again until it has lightened. 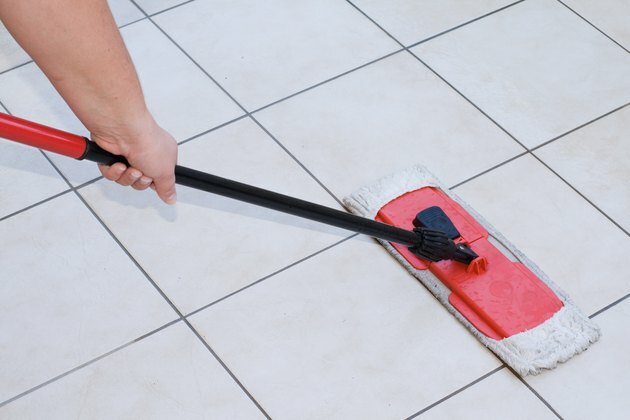 To avoid having stains come back, regularly clean and replace well-used floor mats that are put on vinyl floors. Also, avoid using anything too acidic as a regular cleanser. Once your stains are gone, try coating the vinyl floor with wax every other year so there's a protective layer between it and any products or items that may cause it to stain all over again.